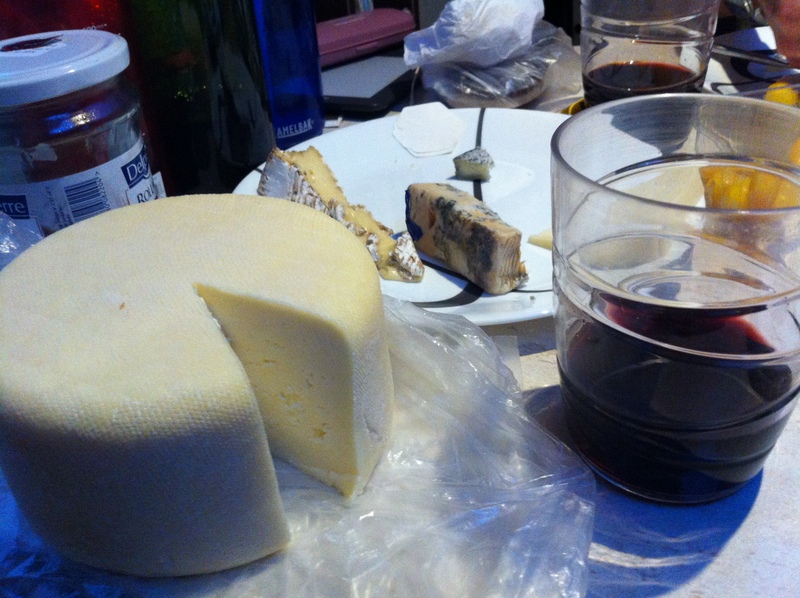 The Pilgrimage, Cheese and wine in the mountains, and Biarritz…. After leaving Bordeaux we travelled south to a small village called Maslacq which is situated on the ‘Sentier de Saint Compestello’ – the pilgrimage that travels through France and down into Spain, ending in Santiago de Compestello. It is approximately 1500 km and there are thousands of people who walk it (or part of it) every year. The place we selected to stay recently opened their doors to accept walkers as a ‘Chambre d’hôte and Table d’hôte’ whilst also joining the France Passion book for ‘Camping Cars’. They have 40 hectares of land and are a farm producing Corn, Yellow Kiwis and Duck produce, unfortunately they have had a run of bad luck over the last few years with both their corn and Kiwi’s not growing so they thought they would diversify and try tourism….. The new business is going very well but their roots are still in farming, so last year they also planted a hectare of ‘baby kiwi’ which will hopefully start producing fruit in 2016 …. A bit of a way off. We had never heard of baby kiwi’s before, but apparently they are the new ‘trend’ – they are about the size of baby plum tomatoes and sweeter than the normal kiwi. The evening meal was relaxed and spent with the family starting with some homemade duck and spicy pepper pâté and rillet with an enormous salad, sausages and rice for main and pears, ice cream and chocolate sauce for dessert – apart from the starters it wasn’t what we would have ordered in a restaurant – but it was all local farm produce (apart from the rice) and delicious and including wine cost us 13 euros a head – really can’t complain. The conversation was enjoyable and we met some interesting people, both the owners of the Chambre d’ hôte as well as the pilgrims. There is something about this area of France / Spain – ‘The Basque Country’, apart from the fact that all the names of the towns and villages start to contain more consonants than vowels and lots of X’s, Ch’s and Z’s – the houses / farms are all white with a rust red edging and shutters – it is very pretty. We arrived into Biarritz late morning and headed to the post office to pick up the Spanish equivalent of ‘France Passion’ which we had asked to be sent to the Poste Restante in Biarritz. A service that I remember using years ago when I travelled through South East Asia to stay in contact with people as internet wasn’t as readily available back then … how things have progressed .… although you now have to pay to receive items at a poste restante whereas I am sure they used to be free. We parked up on an ‘Aire’ which is 2.5km south of the centre of Biarritz on the coast. They aren’t very pretty places (this one felt like it was in the middle of a roundabout, but was actually just one road away from the beach), have minimal facilities if any, but they suit the purpose, you can normally only stay for 24 or 48 hours and are generally reasonably cheap (this one was 12 euros a night). The sea was exactly how we like it ….. rough and a little bit wild 🙂 – I know probably sounds odd to most of you, but there is something incredibly relaxing about waves crashing over rocks …. My morning runs were fantastic – despite the hills, the fresh sea air and stunning views of waves crashing down in front of the mountains was almost perfect. The town itself was a bit of a mix between bond street and Newquay…some very chique boutiques and restaurants ….. and a few kiss me quick hats :). Unfortunately, the coastal views were slightly spoilt as it is quite built up with a fair number of apartment blocks and hotels on the seafront – we aren’t sure if we would come back, but it was definitely worth stopping for a couple of nights and I am sure if you were a surfer it would be one of the places on your list. 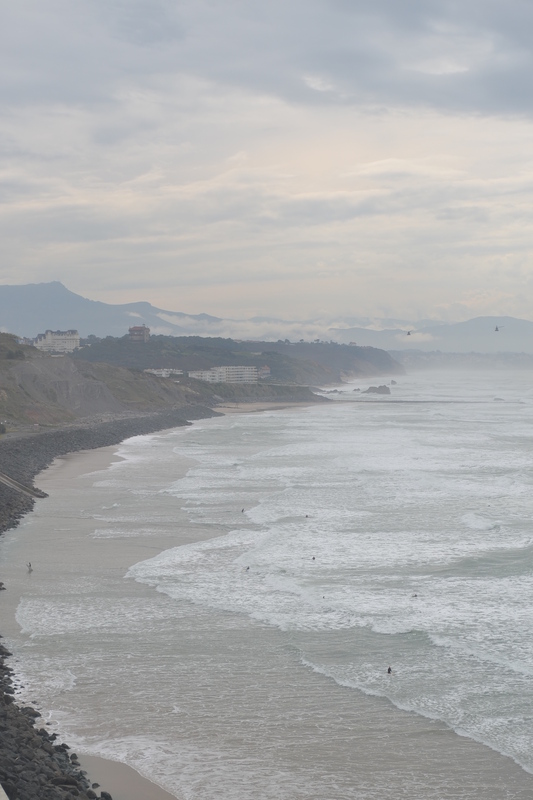 We left Biarritz after the obligatory Sunday morning pancakes on the bar b q with the sun shining and a clear view of the mountains which we hadn’t been able to see for the last few days and say ‘Goodbye’ to France for now … we will be back in 2015 when we travel through southern France to get to Italy. 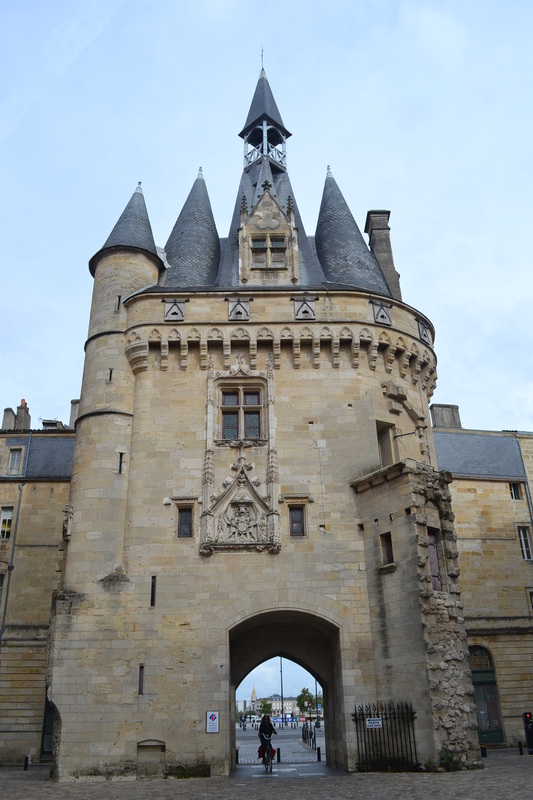 Following a lovely evening enjoying red wine and chocolate with Bill and Angela who have also recently set out for an unknown period of time travelling in their motorhome, we headed to Saint Emilion for our next wine tasting experience…. As we were approaching the Saint Emilion we found ourselves in familiar landscape again with vinyards spreading across the horizon. We parked the motorhome just outside the town and walked up (restricted by a 2 meter width barrier …. we weren’t going to get through there, even on a good day Mikas’ hips are larger than that). 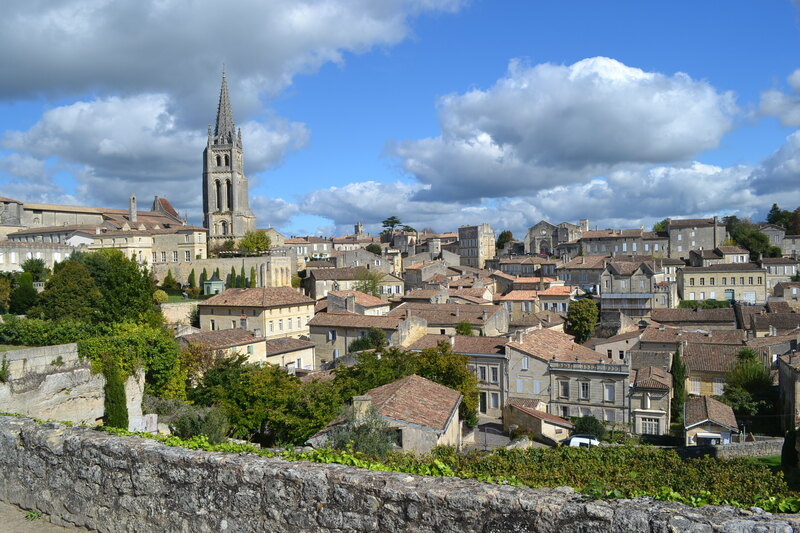 St Emilion is a walled town built on the side of a hill, which was recently made a UNESCO site – it is beautiful. After exploring the town we decided to take one of their suggested walks through the vinyards. Now, I am not sure if the directions were lost in translation (my translation that was) or their signposting was a little under par, but there were definitely parts where a lack of detail helped explain why 11km were going to take us 3 hours 😦 That said, when we worked out where we were going (and increased my French vocabulary) it was a lovely walk. I was curious to understand why the wine in Saint Emilion is so much more expensive than the Bordeaux (which they also produce) and they explained that Saint Emilion is now fully developed as a region and as the wine is popular world-wide the price will only go up as they can’t produce any more than they already have. Bordeaux however is an enormous region and many new vinyards have appeared over the last 10 years or so, flooding the market with wine (what a great thought …) therefore Supply > Demand …. thus reducing the price…. obvious really – although I was expecting him to tell us that the grape/process is far superior – apparently not the case. After a good nights’ sleep we left the vineyard with our wine stock full and headed on to Bordeaux. We picked Village du Lac Campsite (16 euros inclusive of electricity) which is about 8km’s (on a cycle path) outside Bordeaux and guess what …. on a lake. It is a large site, but nicely arranged so it feels quite woody and tranquil, although by late afternoon/early evening it was full. As the weather has been predicted to be a bit random over the next couple of days with showers forecasted, we decided to try and make the most of the dry patch we had after lunch and headed in to Bordeaux on the bikes to have a look round. 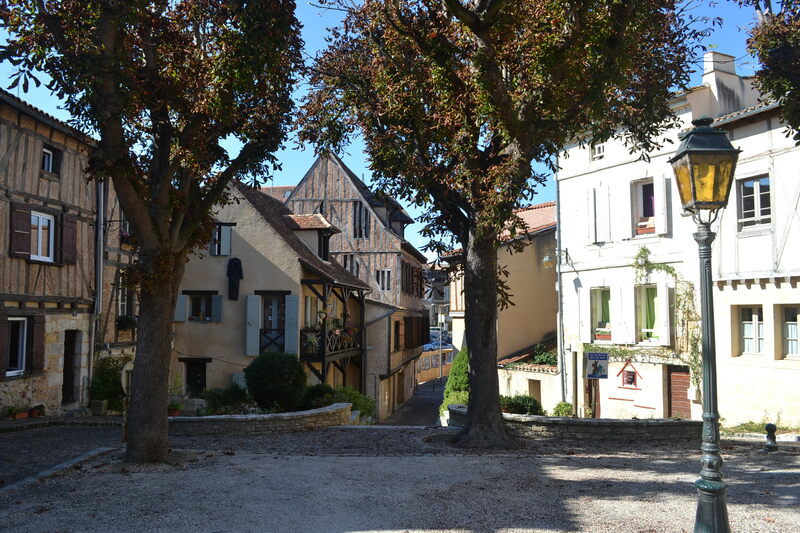 Anyway…..Bergerac is a beautiful old town sitting on the Dordogne river. Architecturally it is very similar to Sarlat, but I would almost say slightly nicer, although that could be due to the fact that it was slightly less touristy and it felt a little more like a ‘real’ town. A large part is pedestrianised to protect the buildings and streets and it is picture postcard. We found a Muncipal campsite ten minutes walk from town which was ‘heavily shaded’ (14.66 euros inclusive), which as long as you avoided the acorn trees (and the goose poo) was really nice. We explored every corner of the town on Friday afternoon and then headed back in on Saturday morning to the local market which was bustling. 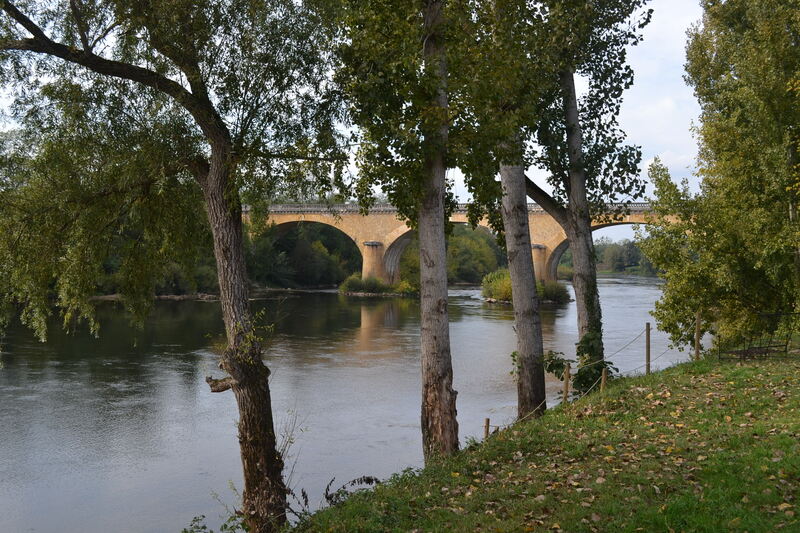 We then walked along the Dordogne taking in some of the scenery in the afternoon … very tranquil. After leaving the campsite in Sarlat we stopped off in town to go to the market and bumped into Ted and Lorraine – who we met a few weeks ago in Saumur – so stopped for a coffee and a catch up exchanging details of where each of us has been and where we were going – it is a small world! Despite not really supporting the process of Foie gras we decided that we should stop off at a farm and learn more. We headed to Le Gros Chene which was in a tiny hamlet called Saint Antoine D’Auberoche where they ‘fed’ the geese for 15 days before culling and turning into pretty much every product you could possibly think of – pate, rillettes, foie gras, smoked, cassoulet… the list goes on. They also produce 12 pigs a year and a lot of duck (foie gras, pate, etc). They currently had 120 ducklings in a barn basking in 30 degrees getting fatter. Despite being impressed with the set up we didn’t buy any foie gras, but we did purchase some ‘canard seche’ – which is duck breast which tastes like a very rich intense serrano ham – absolutely delicious! After a peaceful night with minimal disturbance from the neighbours we set off to Perigueux to have a look round before we headed over to meet an old university friend of Keiths’. 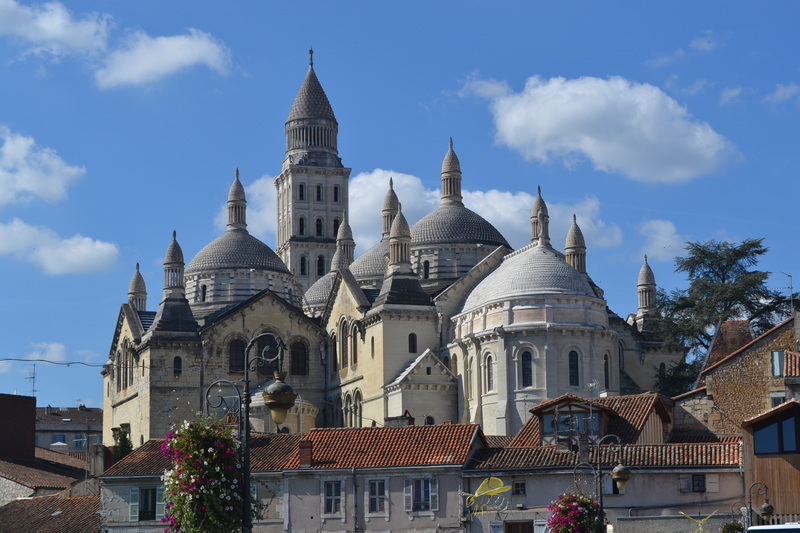 Perigueux is another beautiful old town which is mostly pedestrianised in the old part and it has an enormous mosque like cathederal which looks down over the river. After several attempts with apparently one wheel off the ground (I am glad I was driving and not watching from outside) we made it up the driveway and left Mika looking at the beautiful sunset whilst we enjoyed a glass of wine round an open fire on the terrace! Who would have thought having not seen each over for 15 or so years that the rendez vous would be in such a lovely place – Thank you! ….. and coming off the drive was much easier than getting on – gravity gave a lending hand.